For those who are truly passionate about watching movies, a powerful MP4 video player is rather a must-have companion regardless their preferred genre of movies! Since the market is crowded with all sorts of video player software, it becomes a little hard mission to single out one program you really need. Although Windows Media Player 12 with the native support for MP4 playback is fully compatible with Windows 7/8.1/10, a number of Windows users would like to download a third-party MP4 video player featuring compact UI, solid performance and practical functions. If you are also in such confusion, you are at the right place, the roundup of top 5 MP4 players for Windows 10/8.1/8/7 here can do you a big favor. On the basis of playback test, reviews/votes from geeks and feedback from users, we conclude the following five programs as the best MP4 players for Windows 10/8.1/8/7. 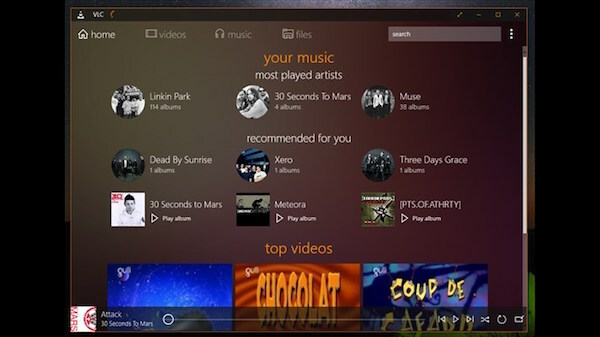 VLC is a highly-acclaimed free and open-source multimedia player designed to play a diverse of video, audio files as well as DVDs, CDs and VCDs. It can directly play MP4 videos encoded with MPEG-4 and H.264 on Windows 10/8.1/7 without third-party codec packs installed. It also brings a concise interface helping users to handle playback task without guess work. Like 5KPlayer, VLC is a standalone program bundled no spyware, ads or user tracking plug-ins. What’s more, this Windows MP4 player grants bonus functions to convert video files and rip DVD/Blu-ray/CD discs to MP4, WebM, TS, MP3, FLAC, iPhone, iPod, Android and YouTube. RealPlayer is a popular cross-platform MP4 player compatible with Windows, Mac OS X, Linux, Windows Mobile and Android. Aside from MP4 support, it also accepts numerous video/audio formats like AVI, MPEG, WMV, MOV, FLV, VOB, RM, MP3, AAC, M4A etc, and provides a list of plug-ins for additional formats support. Moreover, it becomes multifunctional media software which can play and manage MP4 or other video/audio contents on Windows/Mac computers, stream media over the internet, download web videos from YouTube, Vimeo and alike sites, convert videos and burn music to CD. More than a top MP4 player for Windows, KMPlayer is versatile player software supporting a wide range of container formats covering MPEG-4/2/1, MKV, WMV, FLV, AVI, 3GP, QuickTime, VCD and DVD. Internal codecs of MP4 (MPEG-4/H.264) and other formats included in KMPlayer deliver a quick and efficient way of video playback. Apart from playing general videos, it supports 3D and 4K UHD movies/videos. Meanwhile, it allows users to capture video, audio, screenshots and manage subtitles with ease. Although the latest version of KMPlayer is compatible with Windows 7/8/10, it is suggested to use it on Windows 7 (32 bit) computer for grabbing the best performance. BS.Player is another best MP4 player for Windows 10/8.1/7 which specializes in playing video and audio in MP4, AVI, MKV, WMV, VOB, MP3, AAC, AC3, WMA etc. It is an easy-to-use and efficient program with low CPU cost to guarantee a certain level of quality video playback even on a less capable computer. The newest version of BS.Player has been developed as all-sided multimedia software to manage video, audio, web-based TV and radio programs and live-streaming. What bothers users is that it may ask you to install BSPlayer ControlBar for subtitle download instead of removed attached adware in old versions. GOM Player is also a popular video file player for Windows 10, 8, 7 or lower. Like the previous two video players, it is fully compatible with mainstream video formats, such as, AVI, MP4, MKV, FLV, WMV, MOV, and more. Most importantly, it is able to help locate missing videos automatically using the Codec Finder, when it is unable to recognize and play the video you throw to it. But what may disappoint you is its ad-supported nature. After you close a GOM Player window or exit the program, a splash screen will hit you with ads before you close it. GOM Player also provides other useful options, such as, extract audio track from video as an MP3 file with Advanced Audio Capture, capture image, speed up/slow download video playback speed, change the skin of the interface, etc. With the one of the recommended free video players, you can play most video files on Windows 10 with ease. But if you still cannot play some obscure video file formats or 4K UHD videos on Windows 10, you are suggested to use a powerful video converter to convert videos to Windows 10 fully compatible video formats and compress 4K UHD videos for Windows 10 devices. * Convert/Compress HD MP4 videos to AVI, WMV, MOV, FLV, 3GP, Apple ProRes and convert other formats to MP4 for playback on iPhone, iPad, iPod, Apple TV, Android, Surface Pro, PS3/4, Xbox etc keeping MP4 high quailty. * Trim/crop videos to make clips or cut unwanted parts of video files. Merge multiple episodes into one single file. Import external subtitle for better knowing video contents in foreign language. * It is capable of accelerating the video encoding and decoding speed with the advanced NVIDIA * CUDA technology and AMD Accelerated Parallel Processing (APP). * Easy-to-use MP4 Video Converter with simple clear interface.